The tea leaves say it's time for Slothy to take a lil' breaky-break from reality. So I am pulling up stakes and stabbing 'em down again in the fleshy flanks of The Cod for a few weeks. There are hopes for a new relic or two to be forged during this time... I'm thinking a sunset scene with sailboats would be rad. There will be occasional opportunities to blog, but the quality will likely be diminished as my brain becomes more and more waterlogged.... there's already some algae growing in there, I think, and a barnacle or 2. slothy!! a few WEEKS??!! how is this possible?!! what will we DO?!!!!! ARgH. Ah Sloth, rejuvenate, relax, and happy fishing! Enjoy your much-deserved break from reality. 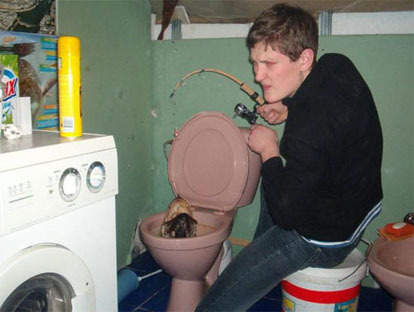 One question: will this toiletbowl fisherperson be there with you at the Cape? He or she is very intriguing. I want some fish toilet soup sloth. will you bring me back some? Seriously though, why is everyone going places, taking "time off", etc? NO. None of you are allowed. well ok, you are allowed and maybe i'm a little jealous. sigh. Sloths It's ok if the quality of the blogs is diminished. You can make it up to us with oily deep tissue massages and sponge baths. Hi JD! Yes i am here with my fishing guru, learning the survivalist techniques such as the art of tying the perfect poo-lure. Wait, I use oxi-flush on my acne. IT WORKS!!! Slothy, I hope you're having a good old time out there. Hey, if I were to drive the Team Shredder van out to your Cod Shack, would you mind whipping out a lil' sunset and sailboat seascape on it's side? Hi Sloths. Welcome back, It's lonely around here without you. Hi Corny, I missed you too. Been hibernating in the Log this morning, recovering and pulling fish-scales from between my teeth. It's dark and mossy in here, & quiet & perfect. Hi FB!!! I am lumpish this morning. i am frumpish. total housewife this morning. 10:00 at that point. sick. I can see how the housewife thing would just take up the entire day. add grocery shopping, kid dealing with, vacuuming and cooking and voila - it's 6pm. i was just on pd's blog. I am begging for a karaoke part 2 on wednesday night. please make my dreams come true. FB, does your butler do housefrau chores? Time for him to earn his skittles! The world must know more of your Karaoke stylin's, FB. You are a master on the mike. I will NEVER forget that Zep, it was a thing of beauty. Sadly, tragically, I will be out of town once again next Wed.... but maybe I can phone it in? Someone can hold a cell phone up to the microphone and I'll belt out the tinny tunes, something in the sea-shanty category I am thinking. oh poop stinkers sloth. poops. bumz x2. well, fb - if no one else can do the private room on wednesday, we can always do a quickie practice session @ winnie's. I want not agree on it. I think nice post. Particularly the title attracted me to be familiar with the intact story.